So, it’s been a month since I’ve written anything on this blog. This has been deliberate so that I could report back on sales, if any. I’m delighted to report that ‘A Suitable Young Man’ has been selling steadily on Amazon Kindle, much better than I expected. If I’m honest, my whole ethos had been to work toward getting print copies available. Any sales I made on Kindle would be incidental. Now I see that Kindle sales will form the biggest part of my income. Not that I’m complaining; it’s been a wonderful surprise. As I’ve mentioned before, I formatted my Createspace book using Tim C Taylor’s ‘Format Your Print Book with Createspace.’ The book proved invaluable but even though this was a second edition, certain things had changed which I needed to work my way through. The main thing to remember is to use section breaks instead of page breaks and first line indentation instead of tabs. Fortunately, there is a previewer so that you can check your work at all times. 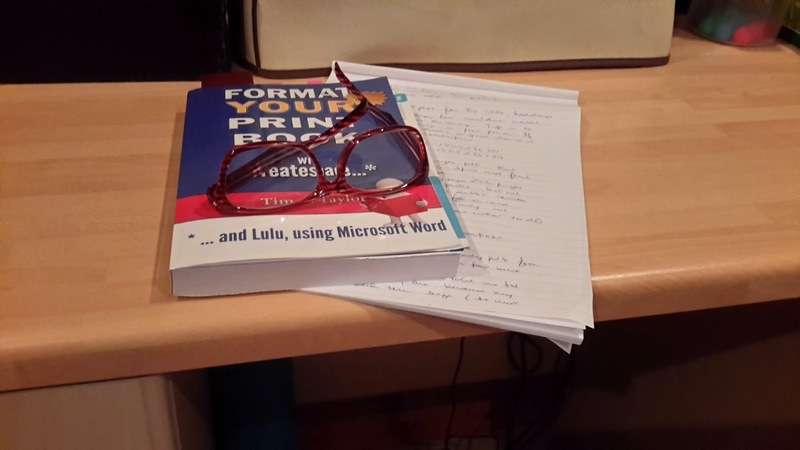 (Tip here: when formatting make use of the ‘print preview’ facility in Word so that you can see how it’s going to look as a book.) Berni Stevens, who had designed my cover for the ebook, had had experience of formatting a full cover (including spine and back cover) and was a big help, eventually providing me with a print-ready PDF copy to upload. Once everything is uploaded to your satisfaction, it has to be submitted for review (to ensure that it doesn’t contravene any of their regulations). This usually takes 24 hours after which you are emailed to say you can go ahead and order a proof copy. There’s a drawback here in that the proof copy has to come from the US. While waiting for that, I completed all the pricing and distribution details on my ‘dashboard.’ When working out a sale price, I took into consideration the cost price of author copies plus shipping from the States and added a profit margin onto that. Incidentally, cost of author copies and shipping costs are clearly given and simple to follow. I’m looking forward to having my print copy in my hand, hopefully some time in the New Year. On receipt of that, I will need to check carefully through, make sure there are no typos or glaring formatting errors. Then, I will be ordering author copies which will take another few weeks to arrive. Because of this, it will be impossible to arrange a book launch in advance, which is a drawback. In the meantime, it will be available as POD for single copies for anyone who wants to purchase it through Amazon UK, no waiting time involved. Now I’m a fully-fledged self-published author – or ‘indie author’ which I prefer – and proud that I’ve done it. And if I've done it, anyone can.